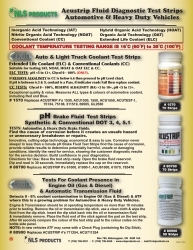 Fluid diagnostic test strips for automotive and heavy duty vehicles. 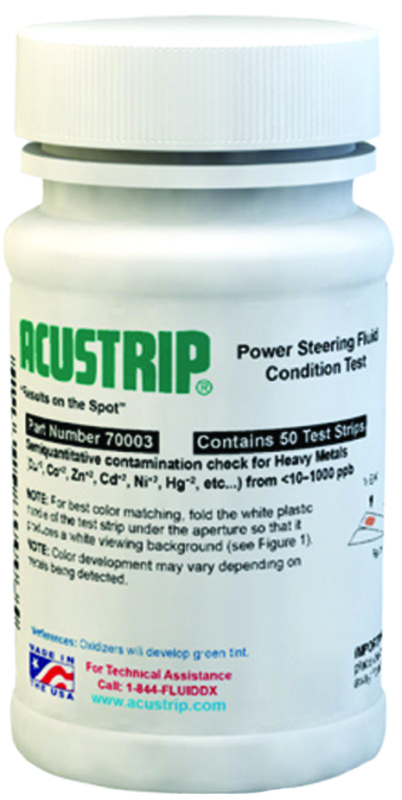 Acustrip test strips are distributed in Canada by NLS Products. 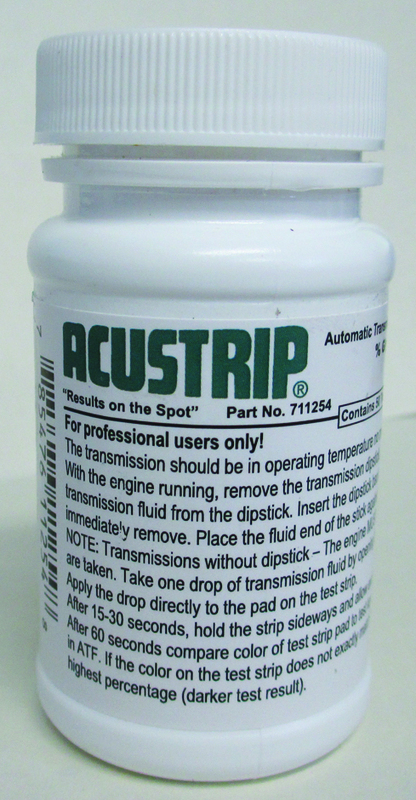 Acustrip is famous worldwide for their diagnostic test strips suitable for a variety of motor vehicle fluids such as coolant, brake fluid and steering fluids. 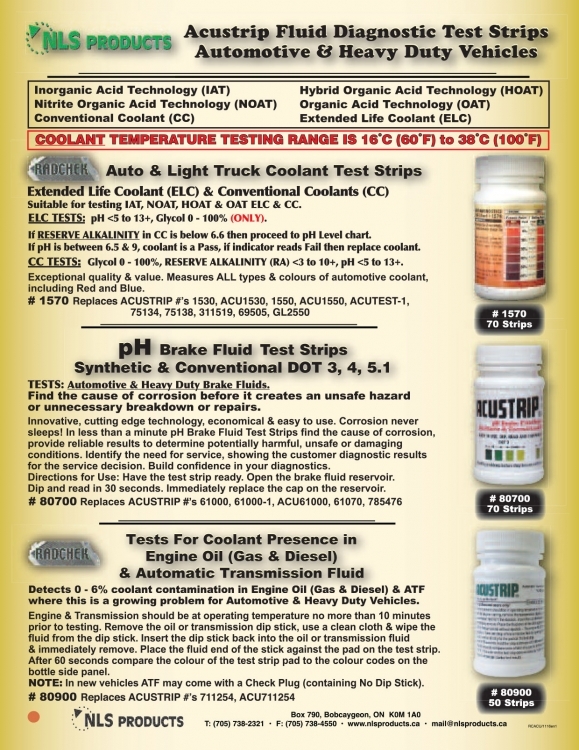 For more coolant test strips, please see our Radchek Test Strips page. If RESERVE ALKALINITY in CC is below 6.6 then proceed to pH level chart. If pH is between 6.5 & 9, coolant is a Pass, if indicator reads Fail then replace coolant. CC TESTS: Glycol 0 -100%, RESERVE ALKALINITY (RA) <3 to 10+, pH <5 to 13+. Exceptional quality and value. 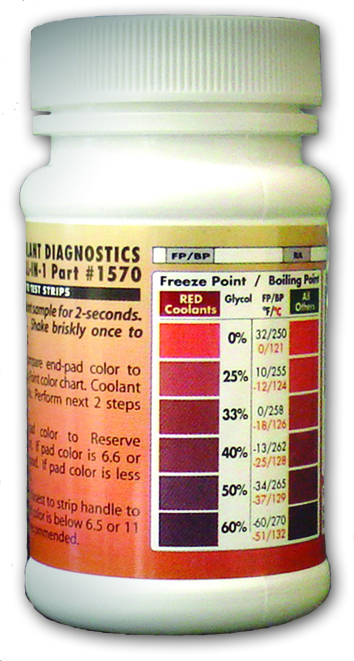 Measures ALL types & colours of automotive coolant, including Red and Blue. 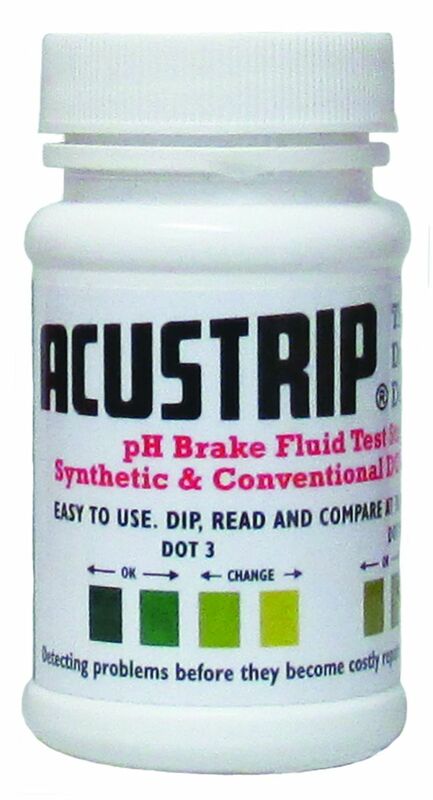 TESTS: Automotive & Heavy Duty Brake Fluids. Find the cause of corrosion before it creates an unsafe hazard or unneccessary breakdown and repairs. Innovative, cutting-edge technology, economical and easy to use. Corrosion never sleeps! In less than a minute pH Brake Fluid Test Strips find the cause of corrosion, provide reliable results to determine potentially harmful, unsafe or damaging conditions. Identify the need for service, showing the customer diagnostic results for the service decision. Build confidence in your diagnostics. Directions for Use: Have the test strip ready. Open the brake fluid reservoir. Dip and read in 30 seconds. Immediately replace the cap on the reservoir. Detects 0 - 6% coolant contamination in Engine Oil (Gas & Diesel) & ATF where this is a growing problem for Automotive & Heavy Vehicles. Engine & Transmission should be at operating temperature no more than 10 minutes prior to testing. Remove the oil or transmission dip stick, use a clean cloth & wipe the fluid from the dip stick. Insert the dip stick into the oil or transmission fluid & immediately remove. Place the fluid end of the stick against the pad on the test strip. 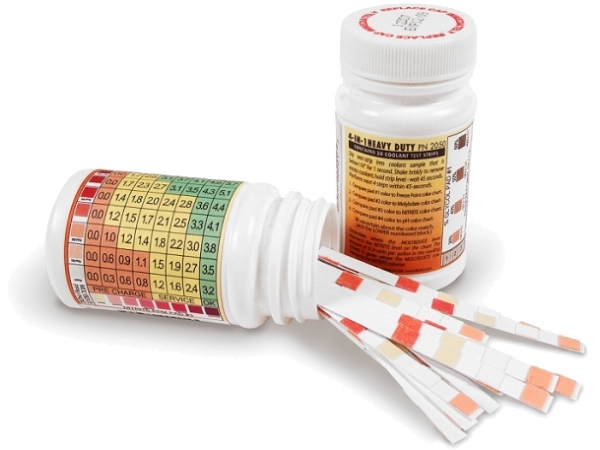 After 60 seconds compare the colour of the test strip pad to the colour codes on the bottle side panel. NOTE: In new vehicles ATF may come with a Check Plug (containing No Dip Stick). Engine (Gas & Diesel) Oil, ATF, Power Steering, Hydraulic & ALL Brake Fluids DOT 3, 4, 5.1, Synthetics & Conventional. Water reduces the fluid's ability to do its work and promotes corrosion. In the case of the Brake Fluids, water reduces the boil point of the fluid potentially causing a safety hazard event. Fluid Diagnostic Test Strips assess the health of the fluid and identify when a fluid needs to be changes. Determining the presence of water is important to maintain the integrity of the vehicle components and early detection of moisture will minimize the impact of corrosion - avoiding costly repairs and loss. Water breaks down oil-additive packages. It promotes the formation of acids that corrode metal surfaces, supports oxidation in mineral-based oils, supports biological or microbial growth, especially with prolonged idling. Test strip must be used immediately after opening foil pouch. TESTS: Engine (Gas & Diesel) Oil (400 ppm), Differential & Transmission (1000 ppm), Power Steering (200 ppm) & Coolant (10 ppm). Identify the presence and degree of Low Level - Wear Metal Ions within a minute. Tests range from 10 - 1000 ppm. Any abnormal presence of METAL IONS requires immediate corrective action, resulting in less maintenance costs, higher operating efficiencies and increased enging and component life. -METAL IONS count meets or exceeds the ppm per fluid as above, the fluids must be changed immediately. -Extremely high METAL IONS ppm - possibility of component failure. Simply dip the strip in a sample of DEF, Coolant or Water and slowly move it back and forth for 20 seconds and then remove, wait 15 seconds, compare the colour of the test strip pad to the colour on the bottle side panel. eg. 30 ml of Oil can contaminate and destroy 30,000 litres of DEF. Glycol 0 - 60%, pH 6 - 13. Suitable for OAT, NOAT & HOAT ELC. Fast & simple way of testing Supplementary Coolant Additives (SCA) today. Essential for engine protection against Liner Pitting, Corrosion & Coolant Dilution. Essential to test Nitrite level up to 4000 ppm in HD Red Coolant. 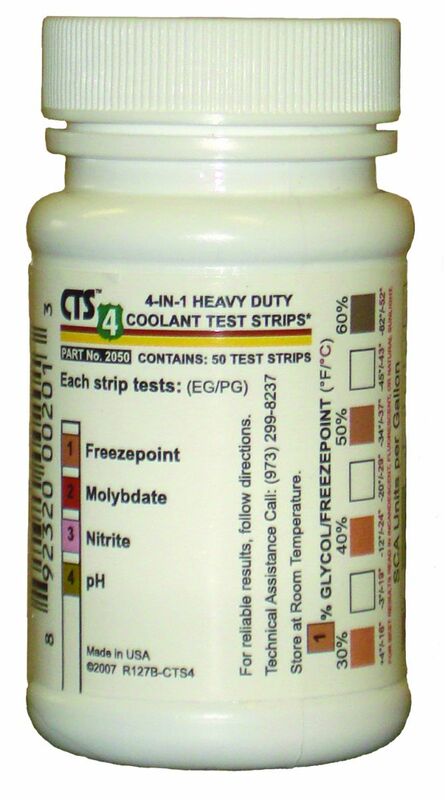 TESTS: Nitrite 0 - 4000 ppm, Glycol (freeze point) 0 - 60%, pH <7.5 - 11+. 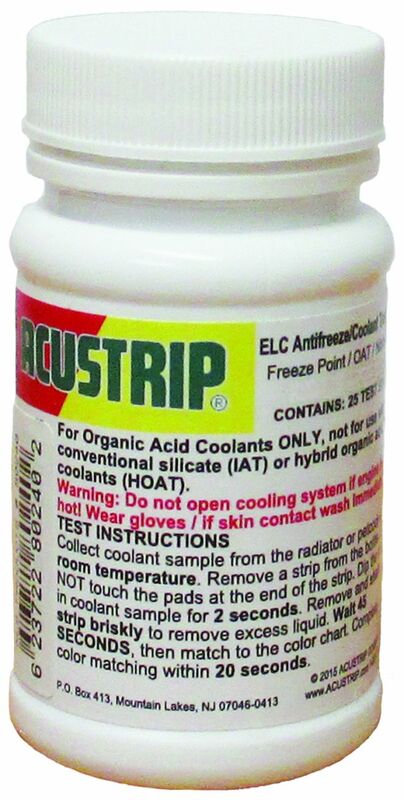 Suitable for testing OAT, NOAT, & HOAT Extended Life Coolant. Fast & accurate results when measuring the engine’s cooling system. 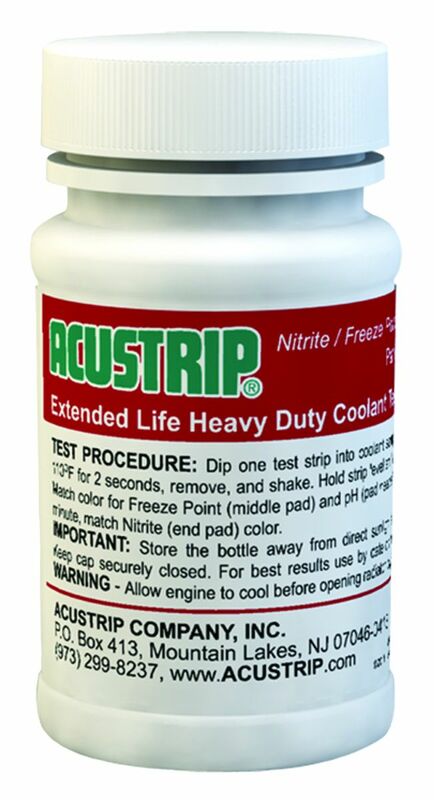 Test strip series provides added ranges for evaluation of protection of the supplemental additives in the cooling system, protection against liner pitting, corrosion and coolant dilution. The quickest, most efficient way to evaluate the condition of Coolant levels to determine if service is required. Protect against Liner Pitting, Corrosion & Coolant Dilution. Automotive fluid diagnostic test strips for. 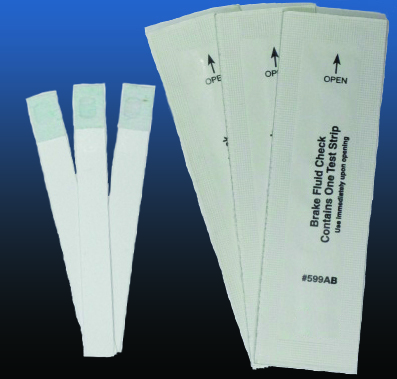 Diagnostic test strips are distributed in Canada by NLS Products.